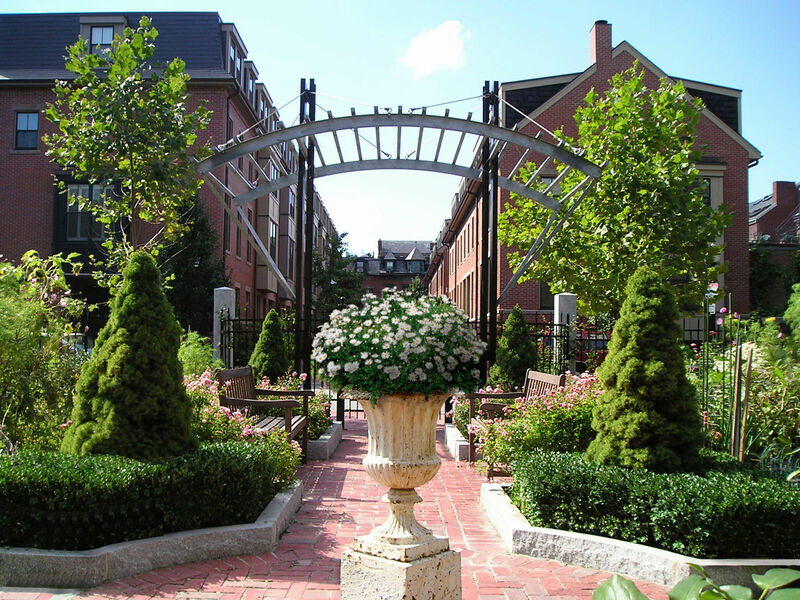 South End is the largest example of Victorian rowhouse architecture in the United States with over 300 acres and added to the National Register of Historic Places in 1973. It is bordered by Back Bay and the Fenway to the West across the Southwest Corridor Park; Chinatown and Berkeley Street on the North; South Boston to the East; and Roxbury and Dorchester to the South. It is distinguished by its gridlike neighborhood pattern, with brick sidewalks, gaslights and 11 neighborhood parks. The construction of the South End began in 1849 when the neighborhood was built on tidal marshes. Many of the Victorian homes have been renovated and newer mid-rise luxury and loft complexes have been built along the South End's major commercial thoroughfares of Tremont and Washington Streets and Harrison and Columbus Avenues. Most of the cross streets in the neighborhood are named after cities and towns served by the former Boston and Albany Railroad : Greenwich , Newton , Canton , Dedham , Brookline , Rutland , Concord , Worcester , Springfield , etc. This neighborhood is one of the most popular places to live due to massive renovation over the last thirty years, proximity to central employment districts, and recent improvements including the Silver Line Transportation system along Washington Street, and many new upscale restaurants and art galleries. SOWA (South of Washington Area) includes a vibrant art and design district between Albany Street and Harrison Avenue; once a group of neglected warehouses and now converted to over 60 galleries, boutiques and design showrooms, restaurants and outdoor and vintage markets.